Raghu Vyas is an Indian artist, working in New Delhi. He was born in 1956 in a small town in Basohli (Jammu). His work is rooted in Indian cultural and artistic traditions. He has studied and drawn the themes of his illustrations from the rich heritage of his country and the Hindu culture. His work has included various series, i.e., Lotus, Sikh and Buddha. 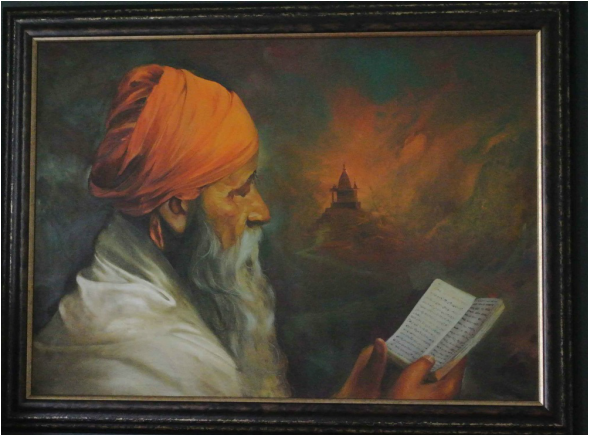 “Holy Man Reading a Book” reflects a Sikh devotee reading Holy Scripture with a temple hiding in the sky appearing to softly bless his prayers. This painting was purchased in early 1990 at the Indian Emporium during a visit to New Delhi by Ramesh Malhotra.